2x 10lb packs of the cheapest flour. I purchased these at my local grocery store, but you could get them from Amazon.com as well. 1 Einstein E640 Strobe with a beauty dish on it + 2 bare portable speed-lights (all of them were on light stands and hooked up to wireless triggers). You could get by with just 1 front-lit speed-light, but 3-4 lights is ideal. 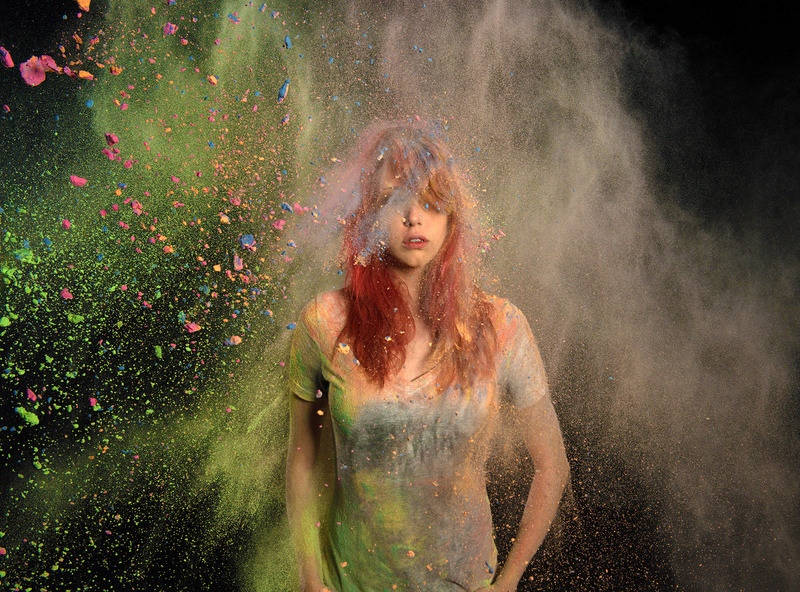 You can dump piles of the colored flour on the dustpan in different areas and then throw it at the model from behind. Avoid throwing the powder around the eyes. 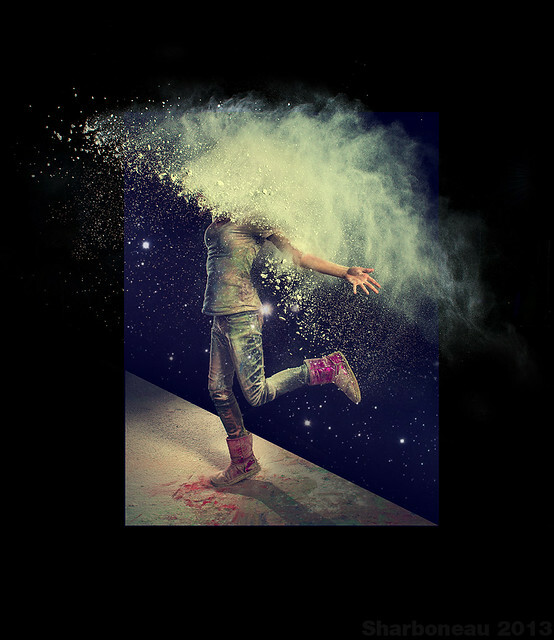 Try to keep the powder/dust away from your camera, as the powder is a very fine. Ideally you would be want to be using a 70-200m lens so you can be further away from the model, but I was using a 24-70mm lens. I used Manual Mode and dialed in 1/250" to cut the ambient light, F8 for maximum sharpness, and ISO ~100 for low noise. After that was dialed in on my camera, I adjusted the flash power up and down while taking test shots until it looked well exposed in the preview screen. After I got it looking normally exposed, I just started taking the actual shots, without having to worry about adjusting any exposure/flash settings. To help focus in the dark, try to take the images near a constant lighting source. Just shorten the shutterspeed to 1/250" to cut off the ambient light. This way, the only light that will show up in the image is the light from the flashes. Remember to shoot in RAW format and then you will be able to increase the Vibrance and Saturation in Adobe Lightroom or Adobe Photoshop. 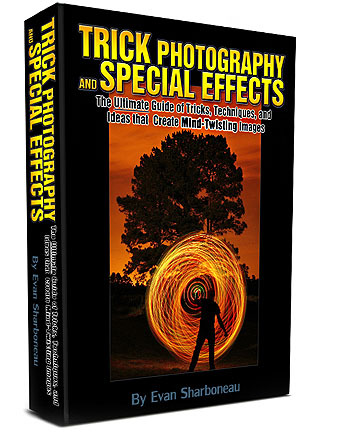 If you liked this video, check out my instructional 300 page / 9 Hour video course Trick Photography and Special Effects - it includes lots special effects tutorials you can use in a wide variety of situations, just like this one. The new photography course for people getting started in photography in general Photography Masterclass will be released very soon, and at a very special launch discount price - so be sure to sign up on the email list in the side-bar to be notified when it is released so you can grab it while the price is super low. Using the rainbow gradient in Photoshop it wasn’t neccessary to use holi powder I think. Floor itself would have done the job as well, or? How cool! How many times did your model have to wash her hair? LOL This is a clever idea. You might have looked at Tempura paints. They are powdered and may have stronger pigment. The powder you used is what the Hindu use for the Holi festival, the Festival of Colors. They throw it everywhere – on each other, their animals, children, etc. LOL It’s really beautiful to see the festival with all the colors! This photo session is reminiscent of that to me. Great tutorial again Evan. Really looking forward to the next book etc as this keeps me on track with many different ways to practice the art of not only photography in general but manipulation as well. Very good tutorial!!! Thank you. Love what you did with the holi powder. We can make them in customized colors and in bulk boxes for any of your future shoots. Wow, this looks amazing. I would love to try it out with my wife (she has long hair!). Extremely cool!! hey … nice job done … hope you would also present a tutorial on liquid colour splash …. thank you, very nice video. We have some better quality powder that we can get you. Just email us if you need it. Hi. What is the solution if you do not have enough lights. Especially the triggered on. I only have one lamp and a off camera ordinary flash. Will it help?